Roland from BtP writes: I remember sitting on the floor with Linda among the Imperial College students for this fantastically-varied and extended Saturday-night gig; Mick Grabham complaining about getting aches following the demands made on his volume-pedalling ankle during the recent recording of Adagio; my amazement at the key-change ending of Homburg, which I hadn't heard before; astonishment at BJ's drum-solo. I'm not sure if the concert played with an interval, but I think it likely (as was the case the following night), as I'm pretty sure I recall being close to the stage at the start, and latterly further back. Gary played guitar for 'Monde' and Chris played the piano; he also featured on banjo for Beyond the Pale, of course. 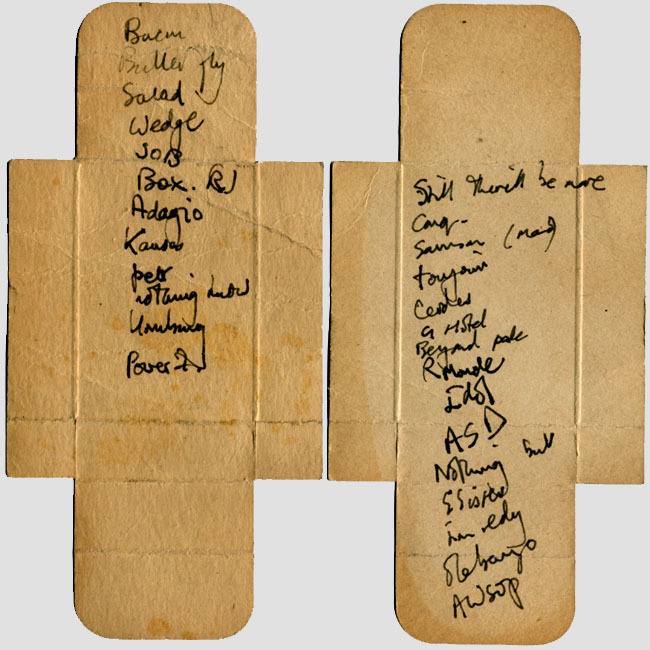 Notes for this setlist came to light on 10 May 2008 inside a scruffy envelope: as the illustration shows, the song-names were written down very roughly, in the darkness of the gig, in fountain-pen on two pieces of cardboard – objets trouvés – originally destined to be folded up to become the trays of matchboxes. Robert's Box is written as 'Box (R)' as if to differentiate it from Pandora's Box, although I can't have known anything about that track at that era. No idea what is meant by the brackets after 'Samson': looks like 'mad'. Old Black Joe was recorded as 'Ole Banjo' , The Poet as 'Pelt' . This was such a gripping concert, however, that the author feels no need to apologise for such solecisms. Click here for a concert ticket from this show. A setlist from the previous month bears many similarities: the band were obviously enjoying playing together at such generous length.